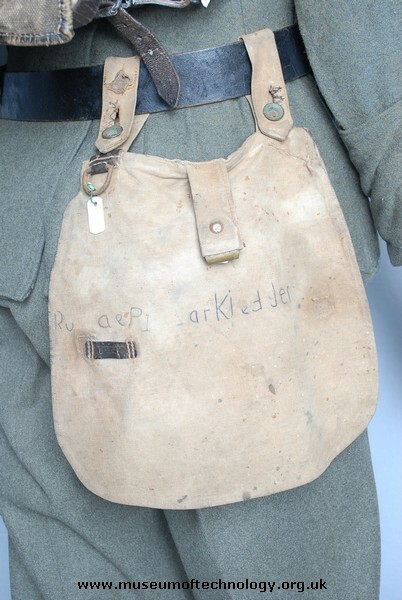 WWI German bread bags never had two leather strips on the cover flap. Prior to 1917, the leather harness of the canteen could be passed through the strip to keep the canteen from bouncing. In 1917 and new shorter harness was introduced and the canteen could no longer be attached to this strip. A second leather strip was added after WWI. The fillet in the middle wears a little clamp. It had to hook on the belt to carry the weight of the content. The buttons on the outer fillets used to rupture, if the Brotbeutel was stuffed. The Brotbeutel used to have two leather loops on its flap. On the left the mess tin was attached, on the right the water bottle.